The marine biologists who concluded that Carlos Gayola’s giant “pearl” was part of the shell used scientific rigor and their extensive scientific knowledge to come to that conclusion. Dr. Hilconida Calumpong, Director of the Silliman University Institute of Environmental and Marine Sciences, has extensive experience in the culture of giant clams. Dr. Janet Estacion, IEMS faculty member, is a clam expert who studied the histopathology of Tridacna gigas as her PhD dissertation at James Cook University in Australia. Its shape follows the contour of the clam, indicating that the material was part of the growth process of the clam and not the result of its reaction to a foreign material as in the case of true pearls. True pearls are usually spherical, or are irregular protrusions (blisters) on the surface of the shell. The presence of well-defined distinct lines on the cut surface of the specimen indicates growth increments of the shell over the years. Such very regular layers, according to Krzemnicki and Cartier, are not commonly observed in pearls, since pearls are formed by deposition of concentric spherical layers within the pearl sack of the clam shell. Calumpong also mentioned in her statement that Tridacna shells are made of aragonite. Finding large amounts of aragonite in the specimen is expected, since this is the form of calcium carbonate that giant clam shells, and even some hardened algae, form in marine waters. 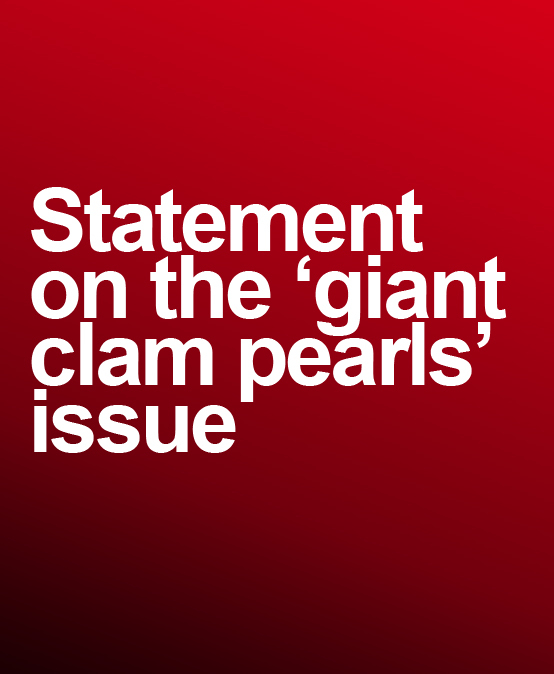 In 2016 experts who were asked to examine the so-called “giant clam pearls” of Puerto Princesa (Kapuso Mo Jessica Soho https://www.youtube.cohe m/watch?v=P-565_5jcAI&t=306s ) also gave differing opinions as to its authenticity based on indicators that they used. Differences in evidence-based opinion such as these are not unusual in the science sector. In fact, it is the plurality of approaches and ideas in science that has made human progress possible through the centuries. Michael S. Krzemnicki and Laurent E. Cartier (2017) Fake Pearls Made from Tridacna gigas Shells. The Journal of Gemmology, 35 (5), 2017, pp. 424–429, http://dx.doi.org/10.15506/JoG.2017.35.5.424 © 2017 The Gemmological Association of Great Britain, (https://gem-a.com/).